The Mystery Worshipper, which produced this report, is run by shipoffools.com, the online magazine of Christian unrest. Mystery Worshippers are volunteers who visit churches of all denominations worldwide, leaving a calling card in the collection plate and posting a first-timer’s impression of services on Ship of Fools. For further reports, visit the Mystery Worshipper at: shipoffools.com. Click here to view the original posting. The church: Pescadero Community, Pescadero, California, USA. Denomination: United Church of Christ. The building: A small, traditional, white wooden church with a classic bell tower. A registered California state landmark. The building, renovated in 2005, has been standing since 1867, and is the oldest church building on its original site in the adjacent two counties (San Mateo and Santa Clara). The church: They really embrace their role as a community hub. In addition to providing religious services and activities, they also host a weekly open mic poetry reading, a Spanish class, a cooking class, and a monthly pancake and waffle breakfast. They are active members of a support network called Puente de la Costa Sur (South Coast Point), which provides services to the numerous agricultural workers in the area. The neighborhood: Pescadero is a hilly, coastal, farm-covered town of about 2000 people somewhat south of San Francisco. It is located on the original Rancho Pescadero land grant given in 1833; before that, it was pasture for Mission Santa Cruz. There are descendants of pre-statehood families still living in this area and working on their farms. The cast: The Revd Detlef Matthies, coordinating minister and minister of the day. Their ministers come from a variety of traditions. There is a rotations of these ministers from week to week, in addition to special guest preachers from other churches. The minister of music was Mark Binion, aided by Jackie Galloway, assistant music minister. The date & time: April 11, 2010, 11.00am. About one-quarter full – the church looked like it could seat about 70, but there were only about 15 or 20 people present. I came in during a last-minute choir rehearsal (a nice arrangement of “Holy, Holy, Holy”). A soprano looked out and chirped, “Hi! Can you sing?” (I answered in the negative.) I seated myself. As more people came in, a couple other people noticed the newcomer, and a couple of them noticed them noticing, so I got several polite nods and two or three walk-up greetings. A woman asked me if I’d gotten a service sheet, and I assured her there was one lying in the pew when I got there. The pew was quite nice – lovely gleaming walnut with a thick velvet cushion-runner. Also, the sanctuary had two faux woodburning stoves (read: gas heaters) that were extremely welcome, given how miserably wet the day was. Quietly rustling, with cheerful greetings being exchanged. It was torrential outside, and people seemed happy to be inside getting dry. The New Century Hymnal and The Holy Bible, New International Version. Mainly a baby grand piano was used, but on one of the songs the choir used a lone tambourine. During the opening hymn, a door banged open. A woman came rushing down the aisle with a box of coloring markers in her hand and a determined look on her face. Two little girls – between 8 and 10 years old, I’d guess – came bounding along behind her, giggling. Once they got settled in the pew, they were angelic. An avalanche of sheet music tumbled down from assistant music leader Jackie Galloway’s podium, and like a true professional she completely ignored it and went right on singing. The Pacific Ocean was miraculously diverted to cascade down upon the church from the heavens. Not really, but it felt like it. Moderately happy clappy. The liturgy was simple and pared down to the basics: doxology, prayer, scripture, hymns, benediction. The songs were of the praise variety, but with a funky originality. 8 – Pastor Matthies is a soft-spoken man with a German accent; his tone was friendly and reflective. He also was a pinch hitter – he’d accidentally told the scheduled minister of the day that she wasn’t scheduled that day, and had to fill in for her. I was impressed with how well he did on such short notice. He began talking about his reading a biography of Albert Schweitzer on a recent plane trip. He neatly managed to tie the ideas he’d gleaned from that to the scripture reading of the day (Acts 9:1-9, Paul’s encounter with Christ on Damascus road). Paul never mentioned Damascus in the writings we have, but Luke felt it needed to be mentioned. As with Schweitzer’s biographer, sometimes people don’t just want to know what you’ve learned, but the journey you took to learn it. It is interesting to note how radically anti-Christian Paul was before his change of heart. As with Schweitzer, it is instructive to examine the beliefs a person has let go of to understand how their beliefs have evolved. The prayers of the people began with the congregation mentioning people by name and asking prayer for their specific needs. This was followed by a corporate prayer. The minister closed, and darned if he didn’t repeat, without notes, the 10 or so prayer requests offered, remembering everybody’s name and situation. And then he said, “And now a musical offering: ‘You’ve Got a Friend’.” No way, I thought. Then minister of music Mark Binion began playing the Carole King song. A parishioner stood up and began singing the song, and after a short time the rest of the congregation began to join in. Your humble Mystery Worshipper did not join in; she was weeping. As if this were not enough, we closed the service with Mr Binion on piano again, playing a ragtime/New Orleans jazz version of “Just a closer walk with thee.” It was fantastic: well executed and wholehearted. It was like the Devil got ahold of Bay Area precipitation and just did his level best to screw with people’s church experience. There was wind. There was rain. There was a mighty blast driving gallons of rain against some very meek looking window panes. 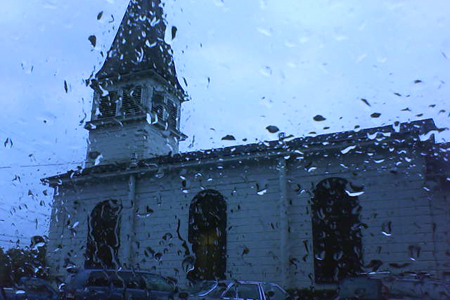 You’ll note the building photo was taken from inside my drenched car. As much as I love the Ship, there was no way I was going to climb out into the torrent to perfect my shot. So yes, if you plan to travel to Pescadero, be prepared for some interesting weather. I didn’t really get a chance to look lost. As soon as people started filing out, I was eagerly invited to the pot luck by more than one person. A few people made chatty Peninsula geography comments to me. At length I settled next to two men speaking Spanish, one clearly speaking his native tongue and the other speaking it as a second language but very, very fluently! One man was drying his jacket in front of one of the stoves, and the other was asking him to clarify the English translation of certain words. The native English speaker turned and introduced himself and his friend. I identified myself as a student of Spanish and asked them (as best I could) if they were members of the church. The native Spanish speaker replied that he wasn’t but that he did odd jobs for them sometimes, and that he had been friends with the other man for many years. He said that the church was full of very good people. His genuine affection for the people was palpable. The coffee was pretty darned good. There were also tea and cookies on offer. At the pot luck I noticed soup and potato salad. Unfortunately I couldn’t stay for that, as I had to dash off in the rain to another engagement. 9 – If I lived in Pescadero, I would definitely look no further. I felt right at home. Glad to be a Christian and glad to be a human being. I think this was the kind of experience that is a hallmark of California worship: people weaving their personality and talents into something worship-worthy.